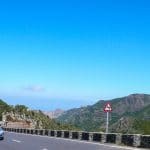 This tour with the hired car to the sunny south of La Gomera starts in Valle Gran Rey and leads through beautiful mountain villages, such as the pottery village of El Cercado and Chipude, to Alajero and Playa Santiago. The tour starts in Valle Gran Rey driving up the main road, passing by the smaller districts of the upper valley. The first mountain village is Arure, which will not be completely traversed. Shortly after entering Arure, just a bit further behind the Bar El Jape there is a branch that leads to Las Hayas. It is the first of several traditional mountain villages which will be on the way of this tour. 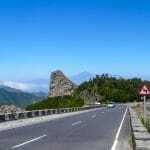 Along a winding road over the plateau one can enjoy a great view to the Table Mountain La Fortaleza and to the sea. After passing through Las Hayas, driving further along the mountain road surrounded by uncountable palm trees, the pottery village El Cercado is worth a stop. The rustic village with its typical rural bars invites you to enjoy a coffee or a refreshing drink. For the hungry ones it is recommended to try the local Tapas. If time allows, a visit to one of the local potteries, where earthenware is still crafted the traditional gomeran way, is absolutely worth it. From there the road takes you to Chipude, over which the huge Table Mountain Fortaleza towers. Another short stop should be considered, for example to visit the well-known church Nuestra Senora de Candelaria. The rustic houses of the place decorate the narrow road and in the interior village one can see green terrace fields and traditional as well as modern homes. From Chipude up in the mountains the road leads from here down to the south. On the road to Playa Santiago there is the viewing point Igualero, with its beautiful little chapel. A stop is a must because from here one can enjoy a marvellous view to La Fortaleza with the underlying green barranco and the Atlantic Ocean in the background. If weather conditions are right El Hierro and La Palma can be seen clearly on the horizon. Further along the road you will arrive at the first place in the south, Alajero. This village is well-known for its Calvary and the only wild growing dragon tree of La Gomera, El Drago. The dragon tree can only be reached through a little hiking tour. The rental car can be parked at the parking spot Cruce de Imada and from there you walk on the right a bit further along the main road until you see the marked branch. The hiking trail leads beside green terrace fields, with various beautiful viewing points, to the dragon tree. The easy hike takes about one hour, stops at the viewing points included, and takes you back to the rental car. Other interesting points in and around Alajero are the small churches Iglesia de El Salvador, Ermita de San Isidro and the Ermita de Nuestra Senora del Buen Paso. Further along the main road heading to Playa Santiago, you will pass by the islands airport. The small airport with its pretty building is in fact worth a little detour. When arrived in Playa Santiago, it is best to relax with a Cafe con leche in one of the cafes or restaurants on the promenade with a nice view over the small port. For those who fancy a swim in the sea, can do so at the villages beach just next to the port. This beach is quiet and protected from currents. After that, we recommend to try one of the delicious fish dishes in one of the restaurants before returning to Valle Gran Rey. Who prefers taking a different road back to Valle Gran Rey, shall take the road to San Sebastian and then at the junction Degollada de Peraza turning right on the road which leads through the Laurel Forest back to Valle Gran Rey. 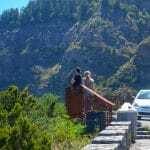 Alajero, Arure, Chipude, El Cercado, La Gomera, Las Hayas, Mietwagen, Playa Santiago, Valle Gran Rey. Bookmark.